Most people have heard the familiar refrain from a parent or grandparent: “turn the lights off, close the door, you’re wasting energy.” In California and other places in the United States, proponents of energy efficiency are sending the same message. Today, I had the chance to speak with Commissioner Dian Grueneich of the CPUC about this ruling and its implications. This article is a summary of that conversation. Commissioner Grueneich is nationally recognized as an expert in energy and environmental issues. She is the lead Commissioner on energy efficiency at the CPUC, overseeing the billion-dollar-a-year efficiency programs budget through the state’s four investor-owned utilities (IOUs). Commissioner Grueneich is the driving force behind California’s Long Term Energy Efficiency Strategic Plan – an aggressive roadmap that is being watched closely by energy efficiency proponents around the world. Energy Efficiency in California: For several decades, California regulators and policy-makers have been active advocates for building codes, appliance standards, and ratepayer-funded energy efficiency efforts, mostly administered through the utilities. While the CPUC oversees these activities at a state level and sets targets for the four IOUs, Commissioner Grueneich points out that several municipal utilities are also active in pursuing efficiency. 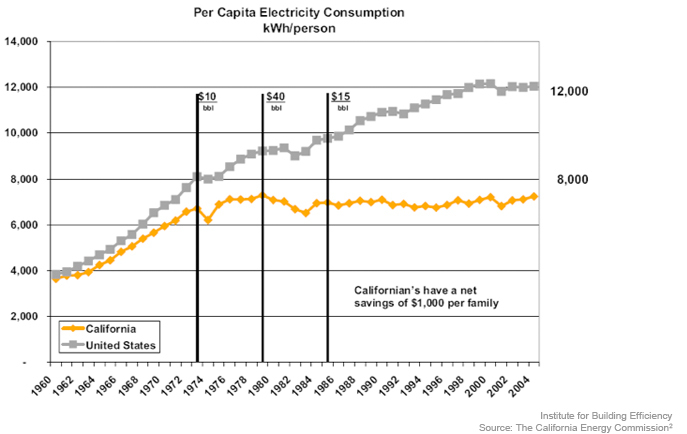 These efforts have produced what is sometimes referred to as the “Rosenfeld Effect”: a constant electricity use per capita in the state over the past several decades, despite considerable economic growth and rising demands for power. Over the same time period (1973-2006), per capita consumption for the entire U.S. has risen 50%. California Long Term Energy Efficiency Strategic Plan: Continuing this trend of national and international leadership, California is integrating all of its myriad efforts around efficiency into a long-term strategic plan. Under this plan, the CPUC and other stakeholders are driving toward a “systems approach” to energy efficiency. They are examining the whole building in an effort to obtain deeper savings than could be achieved through a “single-widget” approach. In addition, the state is expanding beyond traditional rebates and incentives to fund research and development, and support the transformation of markets to enable them to fully utilize the benefits of new technologies and innovative processes. The Long-Term Strategic Plan includes components of marketing, outreach and education, as well as assessment of the workforce needs required to reach the aggressive goals set forth in the plan. Behavior changes: One component of this comprehensive approach to efficiency involves getting customers to use less energy through simple changes in lifestyle. Commissioner Grueneich cites the adoption of seatbelts over two generations, and the widespread practice of recycling adopted over just one generation as examples of cultural transformations in recent history. A similar change in culture is taking place today in energy efficiency, and the CPUC is committed to supporting this change through appropriate regulatory mechanisms. In this sense, she has referred to the April 8 ruling as “innovative” and “game-changing.” Just as replacing the windows in a building can result in less energy consumed, so can persuading the occupants to turn off lights or raise temperature setpoints. Behavior-based energy efficiency, however, does not face the same funding challenges as capital intensive upgrades. “We need both,” says Commissioner Grueneich. California is the third state to allow behavior changes to count toward energy efficiency targets, behind Massachusetts and Minnesota. What drove the decision? While the stage was set by research on human behavior indicating that people respond to peer comparisons, the specific trigger for the CPUC ruling was the emergence in recent years of new enterprise—companies that work with utilities to encourage customers to use less energy. Existing programs require no new technology, simply presenting monthly energy bills in a way that both encourages and empowers customers to change their habits and see the savings. Commissioner Grueneich expects technology to bolster this trend, as the state’s rollout of smart meters will enable the same information to be collected and displayed in near real-time. A key component of these programs is rigid measurement and verification of the energy savings. Today, utilities are required to show that participants in the behavior programs use statistically less energy than a random control group of customers not participating. In addition, the savings must be demonstrated to persist over time. What about businesses? Commissioner Grueneich points out that the wording of the ruling is clear in that it does not restrict the behavioral programs to the residential sector. The biggest challenges she sees for the commercial sector are defining peers for comparison, and assembling a large enough control group for statistical relevance. The field is open and likely to see some great innovation as the private sector responds to this opportunity. New service from CPUC: During our conversation, Commissioner Grueneich announced the pending launch of a new web portal by the CPUC, geared toward practitioners of energy efficiency. Interested readers will be able to find educational resources and other information on this new site.